For the licensed version, see Super Buster Bros..
Super Pang was originally an arcade game released by Mitchell in 1990 in Japan. The game was then ported to the SNES console by Capcom, and released as Super Buster Bros. in 1992. Before that happened, Sachen and Thin Chen Enterprise released this unlicensed port, manufactured and distributed by themselves for the Famicom system in 1991. Unlike the original arcade game and its licensed port, the game does not feature co-op play, as the players simply take turns. Also missing from the original are the different modes of play (Panic mode and Tour mode). 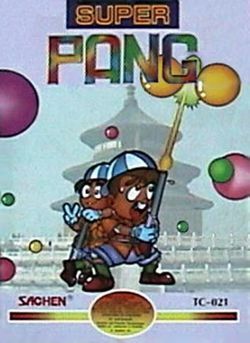 Super Pang is a vertical shooter with the player's sprite being limited to left and right movement along the bottom of the screen, somewhat like Space Invaders, except with faster, free-roaming enemies. The player shoots a grappling hook with rope attached, hoping to hit the bouncing balls moving around the screen. Points are accumulated for more balls and better combos, and a certain amount of balls are required to move on to the next level. This page was last edited on 13 August 2009, at 21:52.